A few years ago, my wife and I had the opportunity to spend the better part of a week in Nashville, TN. While there, we decided to check out the Fontanel Mansion. Fontanel was Barbara Mandrell’s ‘cabin in the woods.’ As of this writing, Fontanel is number 4 of 209 things to do in Nashville according to Tripadvisor. Barbara named Fontanel after her youngest child. I will leave it to you to look up the meaning of the word and to see if you can see the inspiration. I highly recommend visiting Fontanel if you are in the area. It will leave a lasting impression. Barbara’s ‘cabin’ is some 27,500 square feet in size. At the time of its construction, it was the largest log structure on earth. It is still in the top five. The magnitude and scale of the mansion defy description. As I said, you need to see it for yourself. The mansion is so large, the Mandrell family regularly lost their children in the house so everyone had to carry walkie-talkies to stay in touch. A huge indoor swimming pool, indoor shooting range, 5,500 square foot ‘great room’, arcade, commercial kitchen, lavish finishes and irreplaceable casework and finishes overwhelm the visitor. At the time I visited Fontanel, I was struggling personally with what I perceived to be a lack of ability to have the degree of favorable transformational influence in the organizations I served as an interim executive. I knew what needed to happen. I knew what it looked like when it is right and what it looks like when it is not right. I was frustrated by the fact that the organizations just did not seem to be as interested in changing as I expected. Many of my recommendations either fell on deaf ears or were humored then subsequently ignored. You can easily spend an entire day at Fontanel. There is a lot to see and do. It takes a while to begin to comprehend the magnitude of the mansion. To me it was as impressive if not more impressive in its own way than the Biltmore house. Late in the day we had an opportunity to hear Barbara’s daughter Jamie speak. 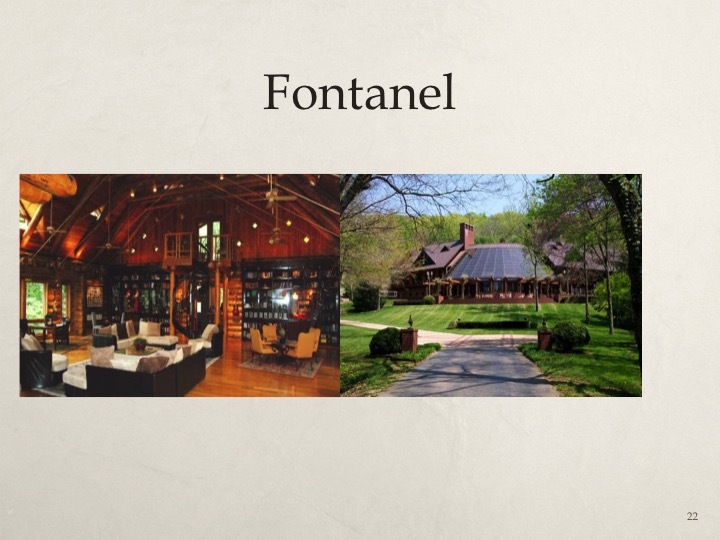 She stayed with the new owners of Fontanel as an interpreter and her comments brought the place to life. I was standing with a group of people listening to Jamie talk about her childhood experience at Fontanel. She was explaining that she had to reach high school age where she started getting out into friends’ homes before she realized that her childhood experience was any different than that of any other child. She and her brothers assumed that their childhood experience characterized by wealth, maids, butlers, chauffeurs and the like was no different than the childhood experience of other children. In one organization I served, the Vice President of Finance told me one day that she was there when I came and that she would be there after I was gone. She went on to explain that she had ‘broken-in and trained’ five CFOs and had survived them all as she would survive me. We managed to co-exist for a few months primarily because as an interim, I resist taking personnel actions that will alter someone’s career unless I am forced into a situation where my options have been reduced to one. In this case, the first thing my successor did was rid himself and the organization of this caustic cancer of an employee. I have seen multiple examples in organizations that I have served of shock and awe when the degree of dysfunction, sub-optimization and loss were revealed. The only thing worse than a dysfunctional culture is a toxic culture. A dysfunctional culture fails to meet the needs of the organization while a toxic culture is more detrimental to the organization because it characterized by active degradation. There are a number of characterizations of dysfunctional or toxic culture many of which are obvious to independent, disinterested observers while being transparent to the people that are a part of the toxic culture. These phenomena are more easily recognized to the degree the observer is viewing the situation academically or clinically without personalization of the circumstances or any of the people involved in the issue. The problem with this is that people rarely change. In fact, most of us are extremely resistant to change. The observation of this phenomena over a long time spent in a variety of organizations has led me to the conclusion that achieving a change in culture without changing the cast of characters is generally a fool’s errand. Ascension Health is the largest not-for-profit healthcare system in the US. Ascension is also the largest US Catholic healthcare organization. Ascension places high value on the worth of individuals and in my experience errs on the side of doing the right thing by people in its employ. I have seen the focus inspired by this culture in Ascension hospitals lead them to make substantial investments trying to salvage leaders that should have been long gone. Sadly, more often than not, these efforts fail and the person ends up leaving the organization anyway. How does this apply to leadership? Every time an organization is presented with the opportunity to fill a leadership position, it needs to think about the role and function that now needs new leadership. In the case of senior executive positions, I strongly recommend that an assessment be conducted to document the degree to which the previous incumbent and the function was meeting the needs of the organization. Some organizations have a stronger bias than others to promote from within. While I support this organizational value, it can be problematic. There is no substitute or alternative that I know of for the enriching experience of working in different organizations, cultures and climates. This experience provides insight and perspective that is un-achievable for persons that have grown up in the organization with most or all of their experience being in that organization. They have no capacity to see things differently than how they currently exist. In some cases I have seen, internal candidates have been victimized by poor or weak mentorship or leadership in the organization. This is not to say that an internal candidate should not be considered. The internal candidate does have the experience and insight to know the history of the organization and the location of every closet where a skeleton is hung and the site of every grave. They can be up to speed immediately while it can take an outsider months to come up to their full potential. The moral of this story is to be cognizant of your culture and the degree to which it might be impeding your ability as a leader to move your area of responsibility forward. You need to ask yourself the very hard question of the degree to which you might be part of the problem. This is one reason that continuing professional education is so valuable. You need to be concentrating on improving your education and skills continuously. In this process, you will begin to gain clarity as to how you may have been sub-optimizing. This is also an example of how consultants can be very valuable to your personal survival probability. Use them for their subject matter expertise but ask them questions and listen to them very carefully. You have experience in a few organizations. They have experience in many organizations and are uniquely qualified to help you understand where your organization might be missing opportunities to improve. Please feel free to contact me to discuss any questions or observations you might have about these blogs or interim executive services in general. As the only practicing Interim Executive that has done a dissertation on Interim Executive Services in healthcare in the US, I might have an idea or two that might be valuable to you. I can also help with career transitions or career planning. Previous How do I get ahead? Next There is nothing that I can do for you. Thanks Thomas. I like quotes and try to memorize as many as I can. In the end, you don’t know what you don’t know. What’s the solution for those embedded members of the organization? How do you give them exposure to what an organization can be? Should sponsored outings to other facilities be part of the regular agenda?